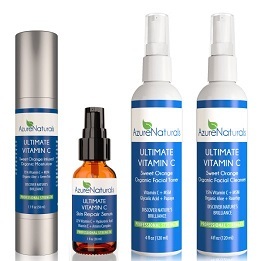 What does Azure Naturals Vitamin C Face Serum do? 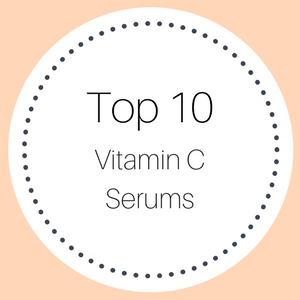 This vitamin C face serum boosts the production of collagen and elastin in the skin and the company claims that it is the fastest working and most effective vitamin C serum available today. It deeply penetrates your skin to repair damage caused by free radicals, fades age spots and reduces fine lines and wrinkles. Your skin looker brighter and fresher and much more youthful. The Azure Naturals lemon infused vitamin C serum has a light weight and non-greasy formula that glides on easily and sinks deeply into your skin. With a combination of a clinical strength 22% vitamin C solution and 11% hyaluronic acid, this vitamin C and hyaluronic acid combination is very popular in anti-aging serums today. Who should use Azure Naturals Vitamin C Facial Serum? 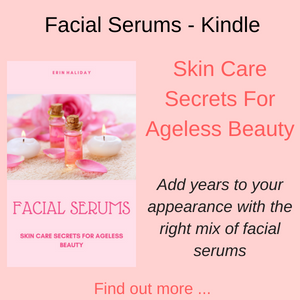 This vitamin C facial serum is suitable for skin types, specifically women with sensitive skin, dry or irritated skin, dull complexions or sun damaged skin, acne or eczema, wrinkles and fine lines. 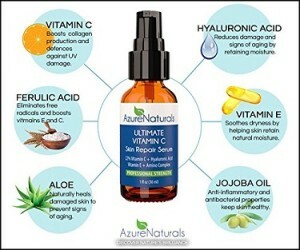 If you have noticed that your skin looks older and you have an uneven skin tone with some loss of definition along your jaw line and your cheeks, as well as too much dryness in your skin, then the Azure Vitamin C Serum may help to make your skin feel younger, softer, plumper and with a more even skin tone. 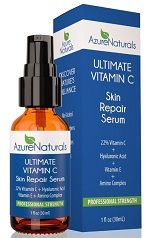 How do you use Azure Naturals Vitamin C Face Serum? Apply this facial serum twice a day in the morning and in the evening. If you only want to use the vitamin C face serum once a day, do so in the morning. If your skin becomes dry after using this product, you might be using too much of the serum – so try reducing how much of the serum you apply and the frequency as well. This vitamin c facial serum contains a clinical strength 22% vitamin C, 11% hyaluronic acid, 1% vitamin E and an Amino Complex. 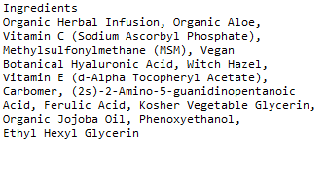 It also contains organic Aloe, 1% Ferulic acid and organic jojoba oil. It is made in the USA, this serum is 98% natural and 72% organic, is paraben free, alcohol free, all plant based ingredients and is not tested on animals. Vitamin C helps us with our immunity and protects us against cardiovascular disease and eye problems. 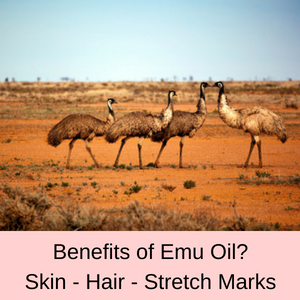 It is essential in cell regeneration and helps with healing wounds and in maintaining the integrity of our skin. Vitamin C is also a potent antioxidant, some say it is a super antioxidant and is vital for protecting us against the damage caused by free radicals, such as pollutants in the air and in our diet and also from the sun. 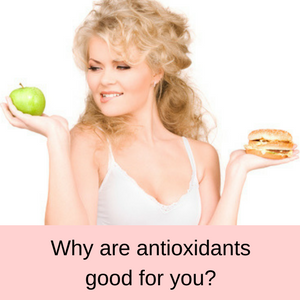 As an antioxidant, vitamin C is a very popular ingredient in many skin care products, particularly in anti-aging treatments. A clinical strength of approximately 20% vitamin C solution is the best strength for maximum absorption via the skin. 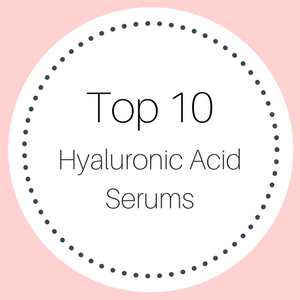 The benefits of hyaluronic acid revolve around its ability to absorb more than 1000 times its weight in water, so it is a super hydrator and, as with vitamin C, is a popular component in anti-aging skin care products. Serums that include hyaluronic acid help to plump-up your skin and increase the production of collagen, giving your complexion a more youthful less aged appearance. Hyaluronic acid is also used as a dermal filler to reduce deep lines and wrinkles in your skin and is known by the trade name Restylane. It can also be injected into joints, when people are suffering from osteoarthritis – to treat pain and inflammation. Serums that contain both hyaluronic acid and vitamin C tend to be very popular and effective in rejuvenating aged skin, reducing fine lines and wrinkles,giving us a more youthful appearance. Vitamin E has long been used in moisturizing skin care products because it is easily absorbed into the skin and also helps to prevent moisture loss from our skin. Vitamin E creams are best sellers and it hasn’t taken long for this vitamin to be included in anti-aging facial serums. Vitamin E is also a potent antioxidant and along with vitamin E helps to fight the signs of aging in our skin, caused by free radical damage. Amino acids are the precursors of peptides and proteins, all of which are essential in so many ways to maintaining our health and vitality. In the skin, amino acids help to produce collagen (and also help to produce skin as well) and so serums containing amino complexes give our faces a fuller and more youthful appearance. Made from rice bran oil, Ferulic acid is one of the most powerful antioxidants which works synergistically with the other antioxidants, stimulating them to work even stronger to repair your skin. Ferulic acid helps to promote the growth of collagen in your skin, reduce fine lines and wrinkles and to reverse the damage caused by free radicals and environmental pollution. PROS: Around 90% of customer reviews gave the this vitamin c face serum either a 4 or a 5 star rating. 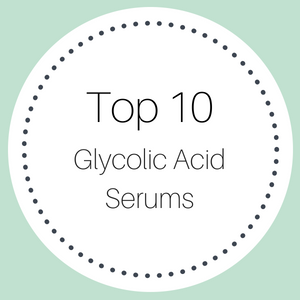 Most stated that this serum glided onto their skin smoothly and that it was very reasonably priced, compared to other serums they had tried previously. 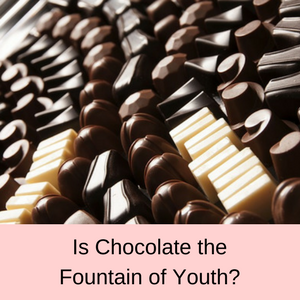 Their skin looked more luminous, with less sun spots, fewer fine lines around the eyes and looked much more youthful and healthy. CONS: Few customers gave this vitamin C facial serum a one star rating. The main complaints were that they found no difference in their skin after using the serum, one had a broken dropper on delivery and one didn’t like the smell. Helped big time with my acne. It didn’t leave any residue or sticky feel to my skin. Definitely recommend to anyone with acne issues. I have been using this serum for a few weeks now and really love it. It is truly amazing, my skin looks and feels 100% better than it did a few weeks ago! 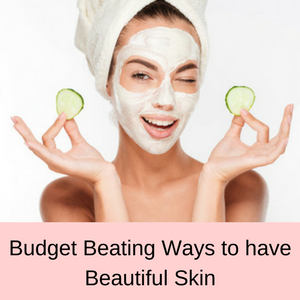 When I look in the mirror I see softer and younger looking healthier skin. If I didn’t know any better I would think I was back in my early twenties my skin is so soft and healthy looking!!!! Even just after 1 week I see the difference in my skin. Try it once and you will be addicted! With three powerful antioxidants in this serum, the great majority of women who use this product are more than happy with the results they have achieved. 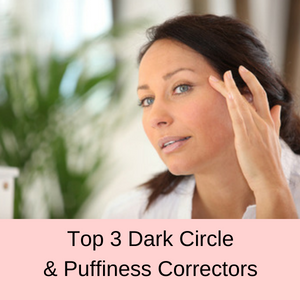 Their skin is more hydrated and supple with fewer noticeable fine lines and wrinkles. 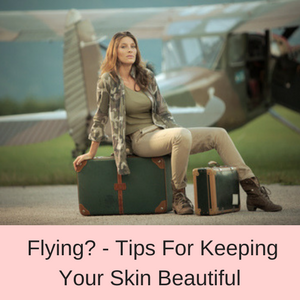 Overall their skin looks fresher and more youthful. 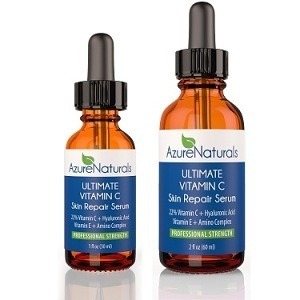 THe Azure Vitamin C Serum is well priced and comes in either a 1oz or a 2oz dropper bottle and is made in the USA.